In this land of many volcanoes, one mountain stands out. 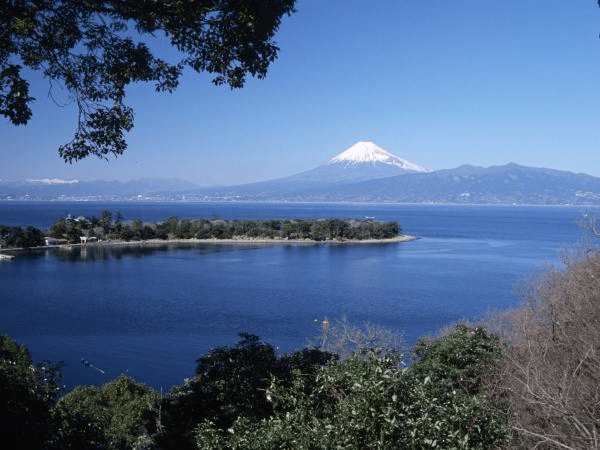 Few people will have heard of Ontake or Sakurajima – but everyone knows about Mount Fuji. It is the tallest of Japan’s volcanoes, 3776 meters high, with a summit crater which is 500 meter across. The smooth cone shows how young the surface is: this volcano still erupts. The last eruption started 16 December 1707, and lasted two weeks. 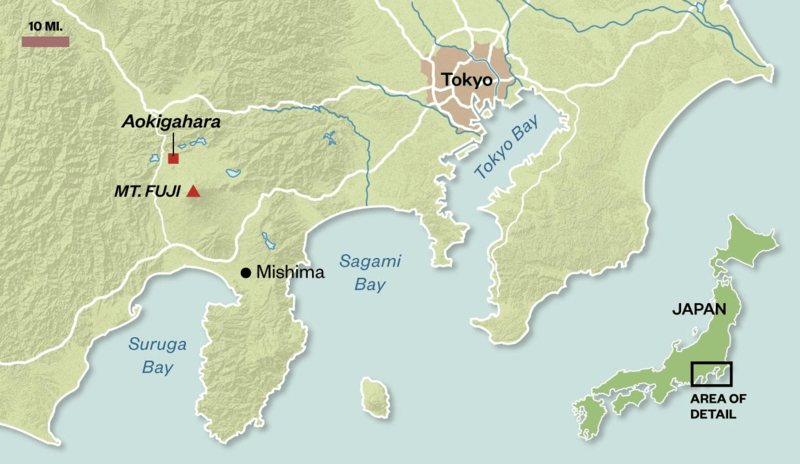 It is famous for having been triggered by a major earthquake (M8.7) which had occurred a month before. It was a plinian eruption, with big explosions but not much lava. Earlier eruptions had been more lava-rich, with a slope collapse thrown in for variety. Fuji has erupted on average once every fifty years, but the current phase of 300 years of quiescence is not unusual. Still, the silence could end suddenly, with little warning. And with every eruption being so different, it is hard to know what it will do next. It can be a scary neighbour. In all its scariness, Mount Fuji is an important part of Japan’s culture. Climbing the mountain used to be a spiritual experience. For some it still is, but it has been taken over by the tourist trail and nowadays it is more an experience in crowd management. During the summer months, there may be 10,000 people climbing the summit trails every day, and several times more just wandering on the lower slopes. The popularity is helped by its proximity to Tokyo, with the trails reachable by public transport. But the mountain has been revered for a long time. Often it is obscured by cloud, but even when invisible it still dominates the landscape because you know it is there. Like a maffia godfather, it can’t be ignored. Fuji is among the most iconic volcanoes in the world. Its near-perfect, youthful shape dominates any view it is in. Fuji’s photogenicity long predates photography: artists have used its shape seemingly forever. 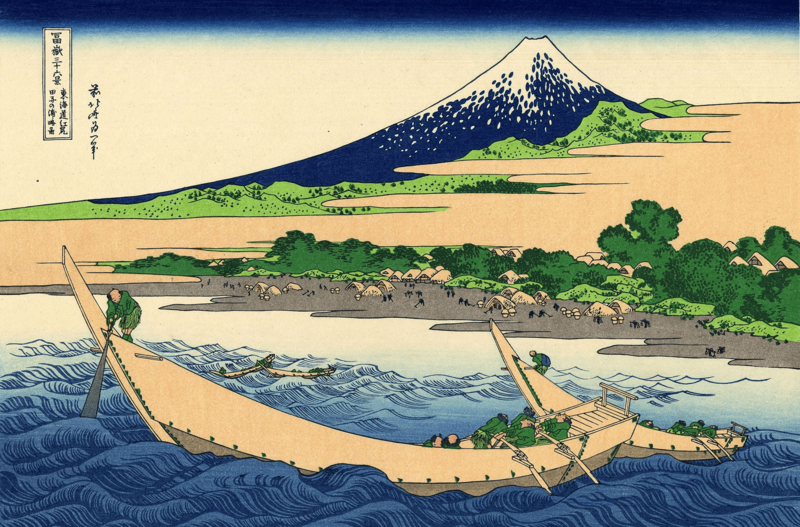 Of all the artistic depictions of Mount Fuji, the woodblock prints of Katsushika Hokusai (1760-1849) are the most famous. He incorporated western ideas of perspective in his work, and in result the work impressed in the west. 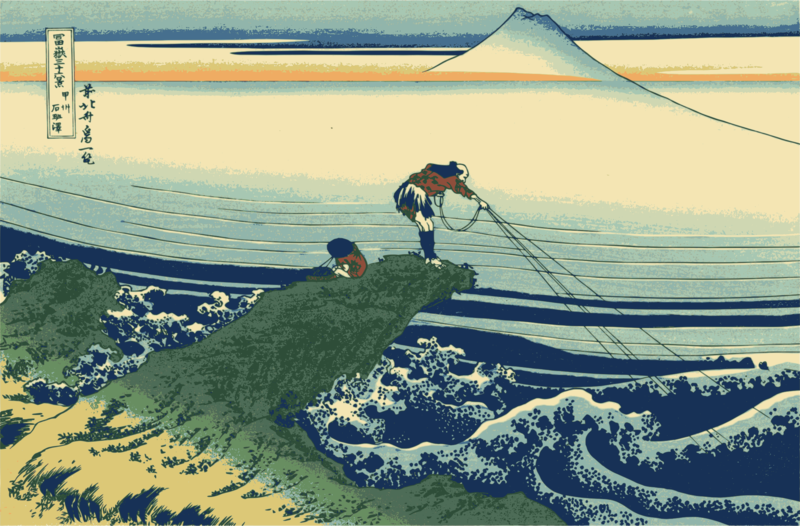 It was Hokusai’s images which made Fuji so well-known world-wide. And indeed, the quality of his work is outstanding. So is the content: the pure variety of the scenes is very unusual for the time. Sometimes it is a simple depiction of the majesty of the mountain. More often, it shows everyday life, the fishermen, the workers in the fields, the early industrial labour, the poor of the land, who lived in the shadow of the volcano. 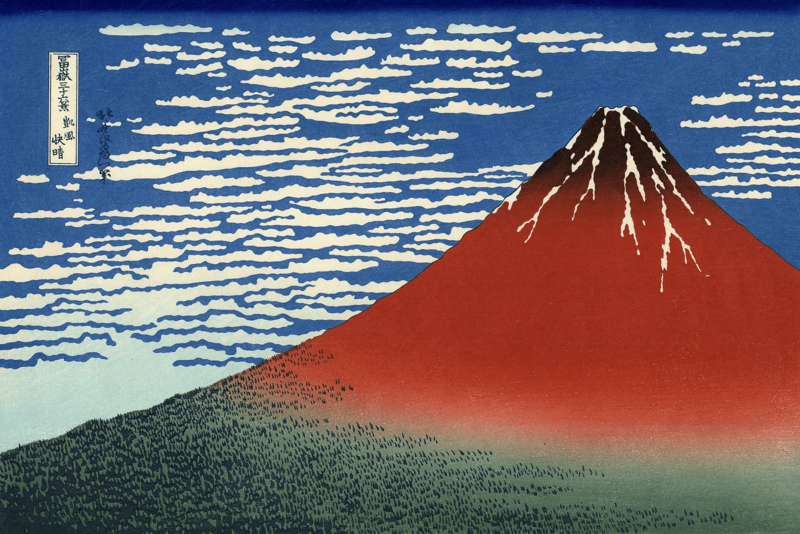 His best-known work is called 36 views of Mount Fuji. Hokusai added more later, and published another book with 100 views, but they are still know as 36. The number refers to the 36 poets of 12th century Japan. 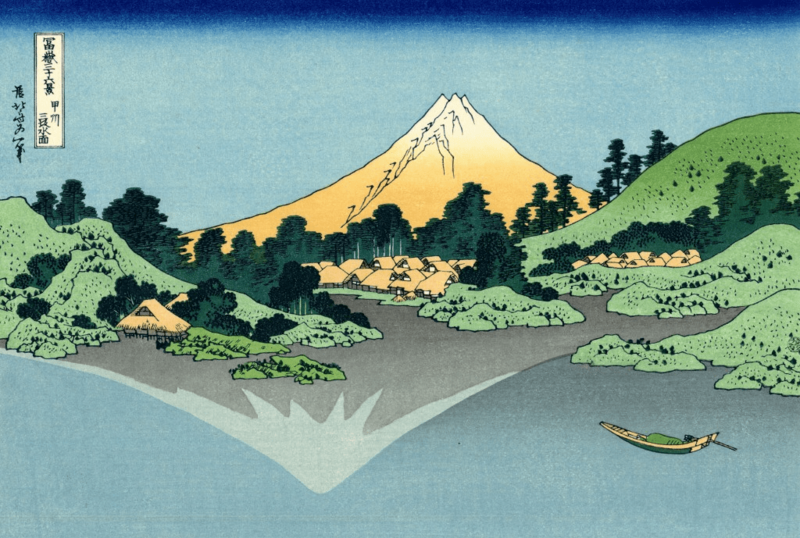 Another Japanese artist, Hiroshige, published his own 36 views and 100 views of Mount Fuji shortly after Hokusai. He focusses more on the landscapes, and is brilliant at creating depth in the scenes. But Hokusai shows more of the life of Japan. 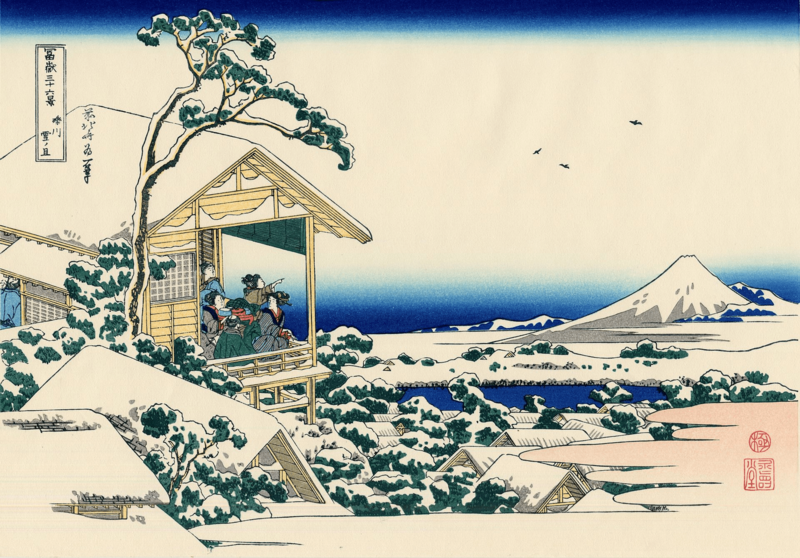 How much of the scenery depicted by Hokusai can still be found in Japan? This means hunting the web for images of the locations of his work. The answer is that some of them still exist, the natural scenery as immortal as the view of the mountain. But undeniably, even where the landscape has not changed, the modern views show a very different world. 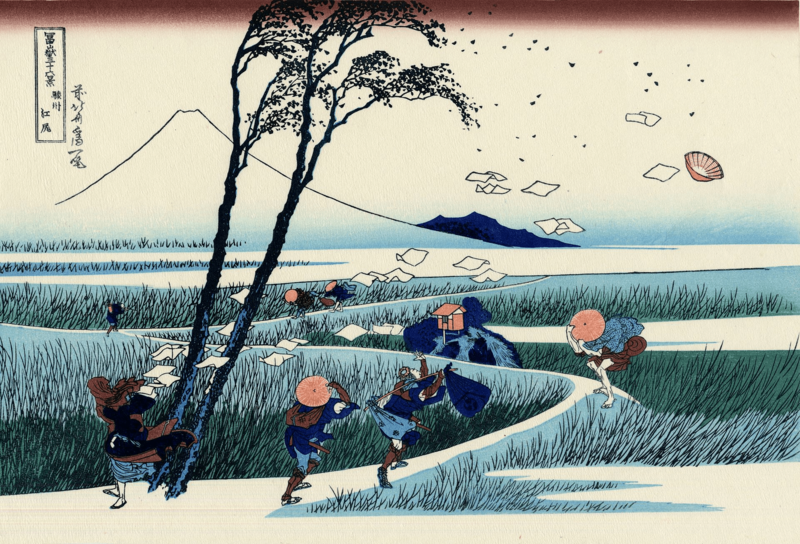 Hokusai draws a (to our eyes) seemingly idyllic but real place of farms, fishermen, and villages, overlooked by the brooding Mount Fuji, sometimes far in the distance, sometimes overpoweringly close. But many of his scenes are set within modern Tokyo, one of Asia’s bustling metropoles. Where the old images reflect at times silence and serenity, at other times activity and dynamism, the modern ones show a hectic modern life. The mountain which dominated the view before is now hidden behind huge skyscrapers hosting Tokyo’s teeming humanity. But even when rendered invisible, the mountain has not gone away. From the top of the skyscrapers, on a clear day, it is still there in all its dominance, dwarfing those skyscrapers. 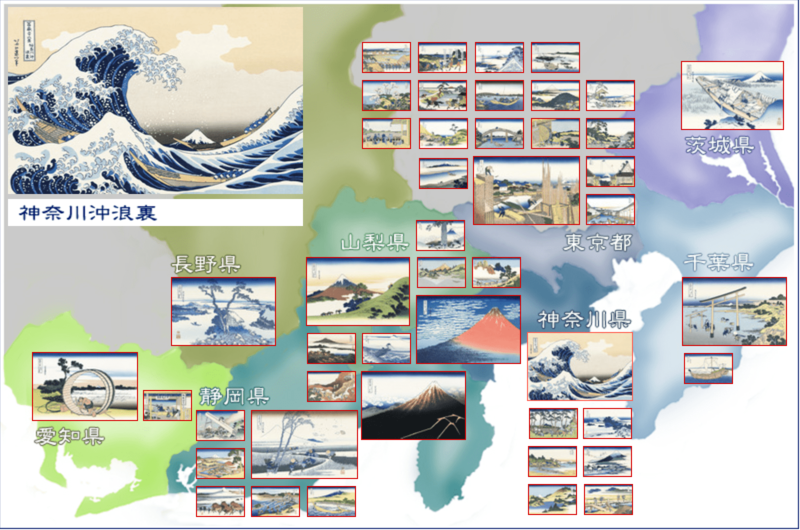 Here is a map of the locations depicted in Hokusai’s drawings, taken from http://www.rakuten.ne.jp/gold/adachi-hanga/series/fugaku36.html. The locations are not always perfectly known. Below are some of those comparisons of old art and new images. 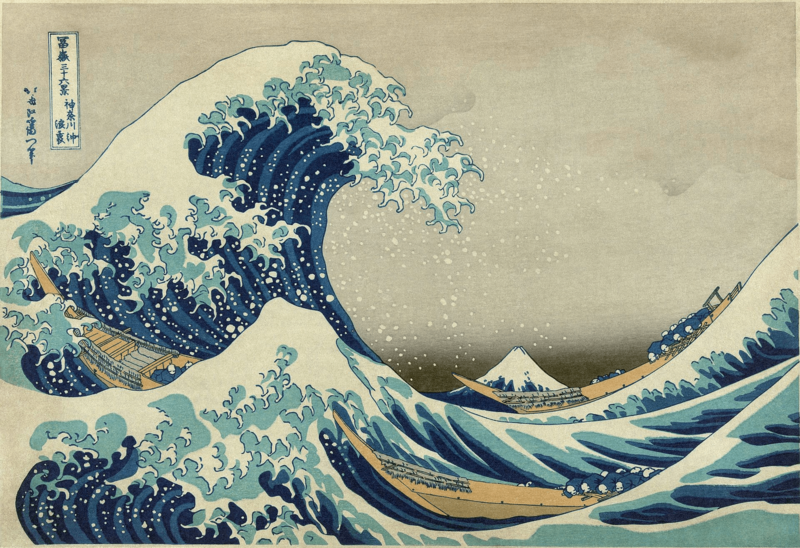 The drawings aren’t photographic reproductions: Hokusai changes the perspective, and amplifies or changes features to bring out similarities and make connections. In contrast, the camera is wysiwyg: what you see is what you get. It can only show what is really there. For full resolution, click on the images. It is worth it. Hokusai’s most famous image is that of the great wave threatening the fishermen, whilst framing the distant distant shape of Mount Fuji. The shape of the waves, and in fact those of the indistinct clouds in the sky, mirror the shape of the mountain, while the spray seems to fall like snow on its peak. The dynamism of the wave and the fishermen is contrasted with the immortality of the mountain. The fishermen are in peril – but the mountain will always be there. Hokusai’s images were drawings, carved into woodblocks by several other craftsmen, and those woodblocks were used to make the prints. This was always about mass production: there is no single original. The colours were part of the wood print, and different reproductions from the same image but different woodblocks will not have identical colours. The range of colours used, and especially the predominance of blue (rare in older European art!) is notable in the work. The wood blocks would degrade over time, and later printings from the same block would be of lesser quality. Also, not all the woodcarvers were equally skilled. This, of course, is an example of an image that no camera could duplicate! This is a view of Fuji from the rice-growing fields. It shows a labourer working on a large tub. The curve of the tub, mirrored by the hoops on the ground, frames the contrasting triangle of the mountain. The modern comparison shows a similar geometric theme, but otherwise is taken from a different world and certainly is not from the same location. A man is fishing on the Fuji River at Kajikazawa. A child keep holds of the basket, used for the caught fish. The fisherman is precariously located on an overhang. 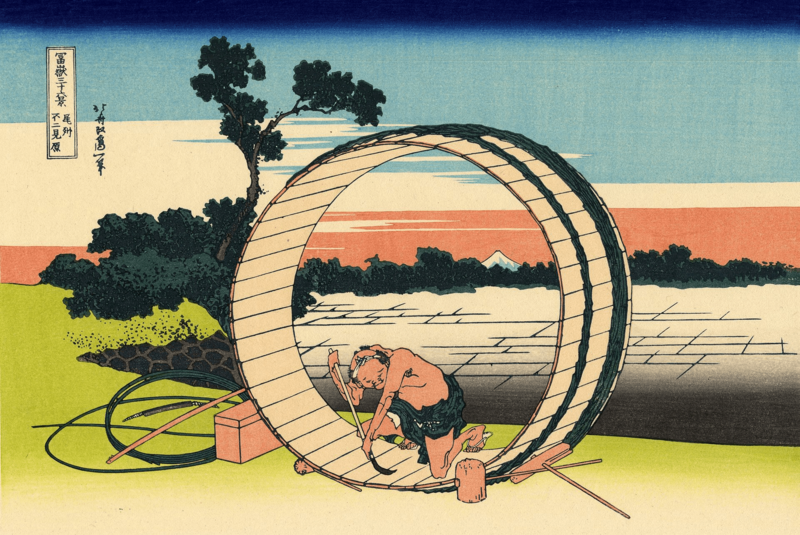 His bent back mirrors the shape at the summit of Fuji, and the lines holding the net follow the shape of the the slop, turning the fisherman at work into an image of Mount Fuji. The town of Kajikazawa is since recently known as Fujikawa. The town is still not large, and the mountain is still visible from here – these things have not changed. But now, the most compelling view along the shore is that of the famous bullet train on the Fujikawa Bridge crossing the Fuji river. The speed of life has increased – but only in passing as the bullet train does not stop here. 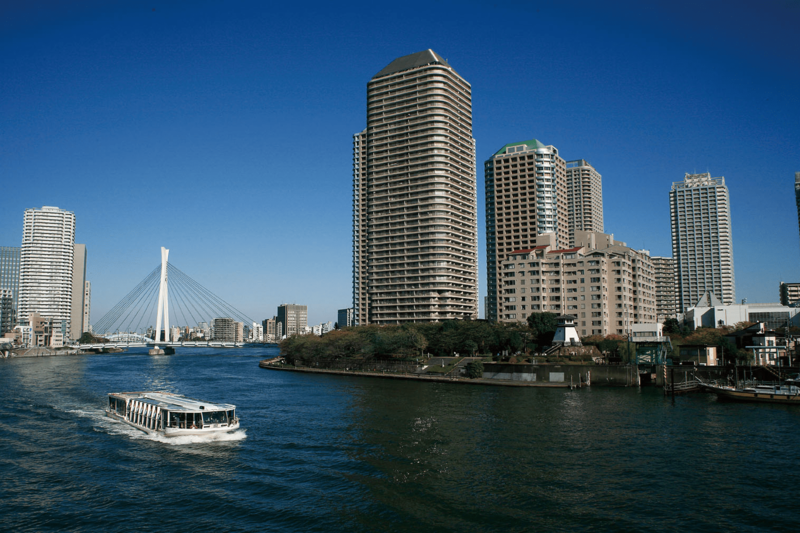 Another boating scene, of a ferry crossing the Sumida river. The diverse passengers include a samurai, pedlars, a nursing mother, a blind man, a monk, and a bird-catcher with his tall pole. All are looking at Mt Fuji on the horizon. A variety of other boats are near the Ryogoku bridge. The curves of the bridge and boat complement each other, and are in contrast to the straight lines of the mountain. There is still a bridge here but it is obviously not the same one. 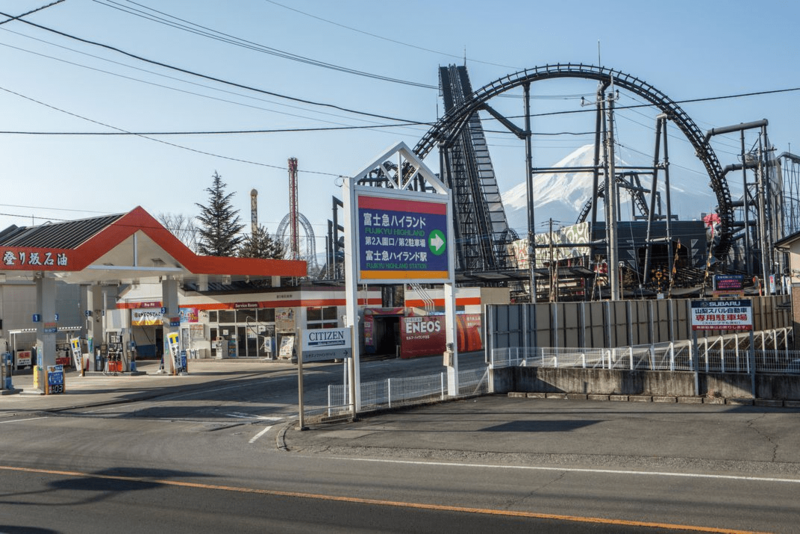 The rural feel of the past is lost: now this is within Tokyo and the mountain can no longer be seen from ground level. Lake Kawaguchi is one of the five sacred lakes that surround the mountain. Fuji is not as smooth from this direction, hence the deep cleft coming down the side. The lack of snow shows that the image depicts a summer or early autumn scene. But the reflection shows a very different Fuji: it is bigger, it is displaced, and it has snow cover. The reflected Fuji shows a different place, in a different season. The modern photo shows almost the same scene. 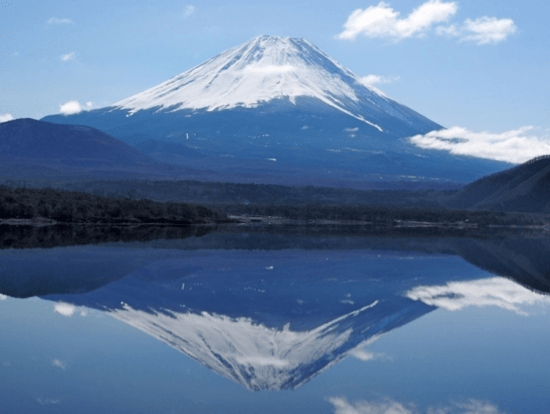 It is not possible to simultaneously match both views of the drawn mountain: the photo matches the reflection of Fuji rather than the real thing. The river on this drawing is the Fuefuki. This view is from the north, and from this angle Fuji is more rugged with multiple peaks. It is dawn and travellers are preparing their horses. On the far right is a bridge. Unusually, the labelling is on the right. The hill on the bottom right has a similar shape to Fuji. The modern image is from a webcam. This in itself already shows how much things have changed. The location is not exactly the same, but not far, and it shows the early (winter) dawn. The artificial lights now rival those of the sky, again showing how technology has changed our life styles. Men and women (who could be geishas, as tea houses were not always as innocent as you might expect) at a small but imposing teahouse. They are looking at Mount Fuji, in the morning after a snowfall, the snow cover connecting the local scene with the mountain. Nowadays this is Bunkyo-ku, and it has been completely overrun by Tokyo. Mount Fuji may still be visible from the top of the civic building, on a rare haze-free day, but for life on the ground it is well and truly hidden. The buildings are even more imposing than the old tea house but the serenity of the old view is a distant dream. Here Fuji stands alone. The lower slopes are in darkness but the upper slopes already catch the sun. The clouds form a halo around the summit, which is almost clear of snow. It is a simple but powerful image. Fuji can still be seen like this, with luck. The image shows people having a picnic, watched by a few walkers. The hill behind them is covered in pine trees, with stylistic stems. On the right, one of the trees has a trunk which is a copy of a person’s leg. Just behind are two blue-roofed houses. The hill shields the people from the view of Fuji- or vice-versa. This area is now a wealthy district of Tokyo. I found a photo what I think shows the same hill, but just as for the people in the drawing, Fuji has to be imagined. People are battling a storm, in an inhospitable, empty area of Japan. A woman has lost her papers: they are blowing away in the storm. One person has lost his hat. The green areas are a swamp, and the white is water. 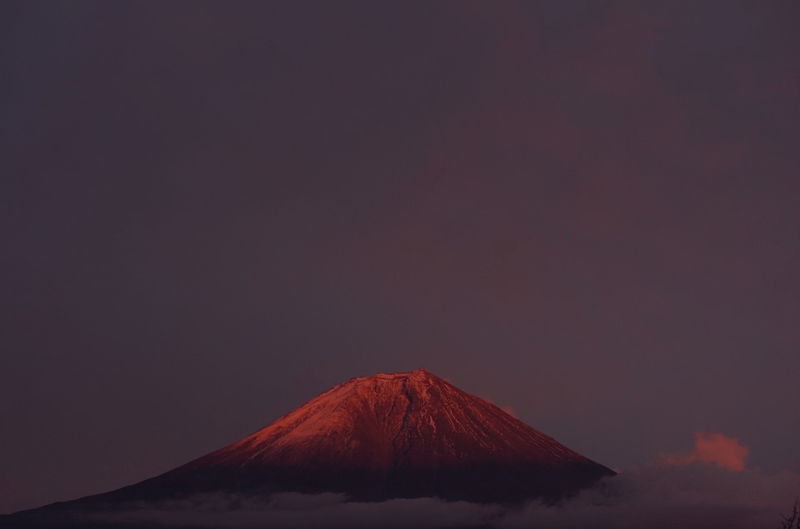 Fuji is depicted by a single line. Nowadays this is Shizuoka. The swamp has been drained and the land morphed into a town, but the scenery hasn’t improved that much. Fuji is still there. The fishermen have cast a net but the sea is choppy and the oarsman is hard at work to try to keep the boat in place. The curve of the boat reflects the curve of the slope of Fuji above it. There is some doubt where exactly along the bay (now called Suruga Bay) this is. 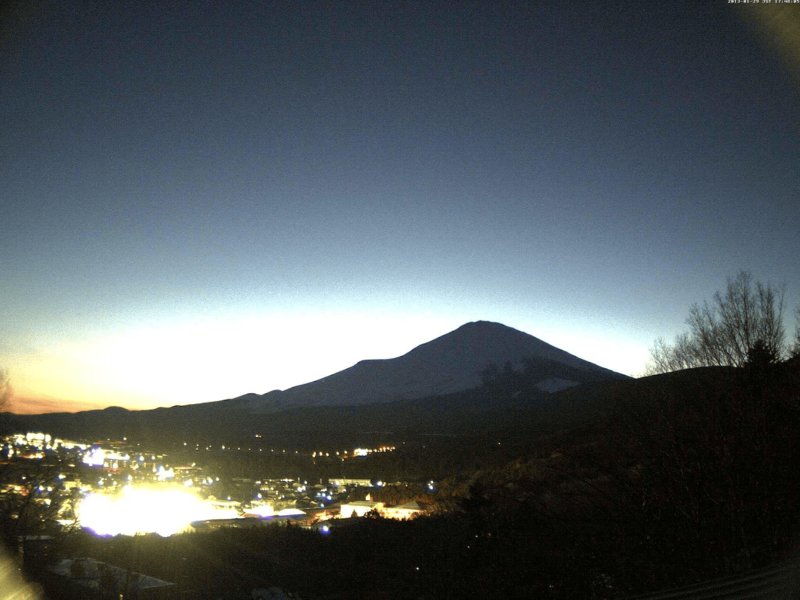 The photo shows how a long mountain obscures part of Fuji, in the same way as in Hokusai’s view. The original image may have been done from the water or from the tip of the peninsula. Superficially, little has changed. Even the crater at the summit of Fuji still has the same shape. The horses, each with their own colour, are galloping along the river – the riders are in a hurry. The two trees frame Fuji: its brown colour make it seen like the fourth horse. The whole image is a study in brown, from the houses to the trees. This scene is hard to replicate. The browns are certainly gone. The Sumida river flows through central Tokyo, and although the river remains, albeit channeled, the surroundings have not survived. The fields and the view are gone. 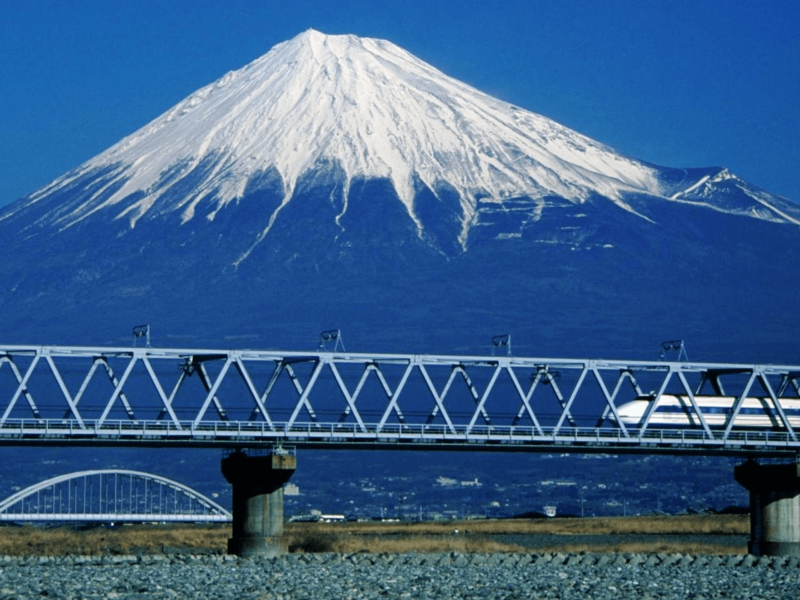 In the photo, the bridge replicates at least the shape of Fuji, if not its colour. The trees have been replaced by skyscrapers. Rather than showing the whole temple building, Hokusai focusses on a detail of its roof. But this is not a study in architecture: look harder and you see four people at work on the roof. Someone, not shown, is flying a kite, which is as ornamental as the temple. The town is shown in some detail, with a tower which in hindsight looks like an early mobile-phone mast. Fuji seems dwarfed by the detail in the foreground. Its clean lines reflect the temple roof, but not its ornamentation. 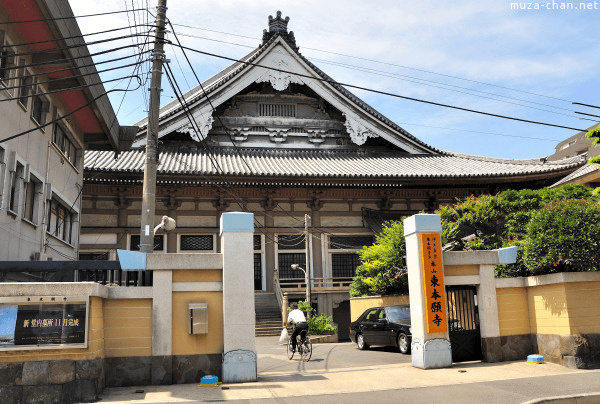 The temple in Edo (modern Tokyo) is still there, but it isn’t the same building. The temple has been rebuild more than once, after falling victim to fire. Fuji is not the only destroying force here! The shape and ornaments have been kept in the rebuilds. The kite has not, but the wires take their place. The surrounding buildings block the view of the Fuji. 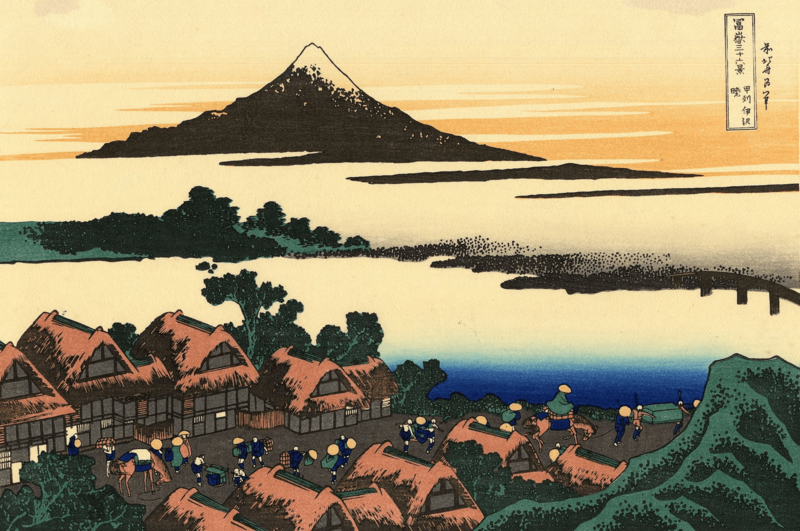 Hokusai has shaped our view of Mount Fuji. The mountain is so famous because of his work. But his work is famous not because of the mountain. 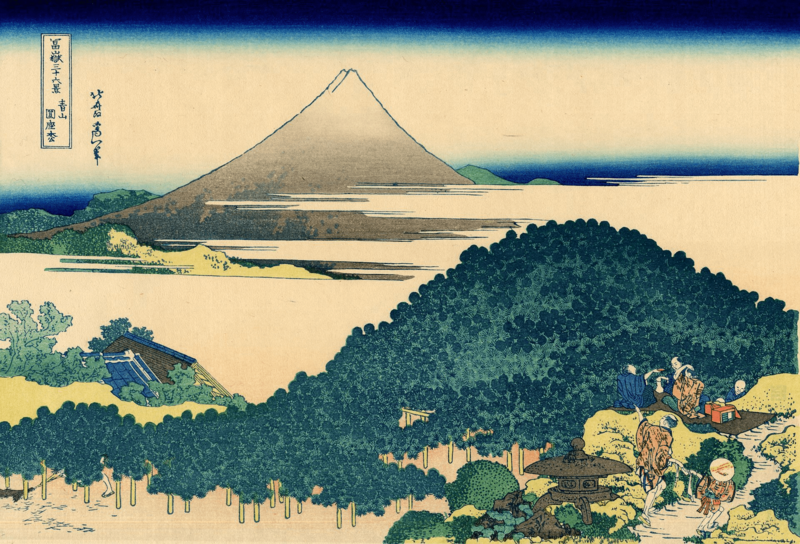 Hokusai showed us the lives of the normal people, below the sacred, and sometimes distant mountain, but deeply connected to it. Fuji has not erupted in the time since these images were made. The shape of the mountain is still the same. This can be seen by comparing the modern photos to the old drawings. This may not be the case after its next eruption: volcanoes constantly remodel themselves, and their shapes are temporary and fluid. 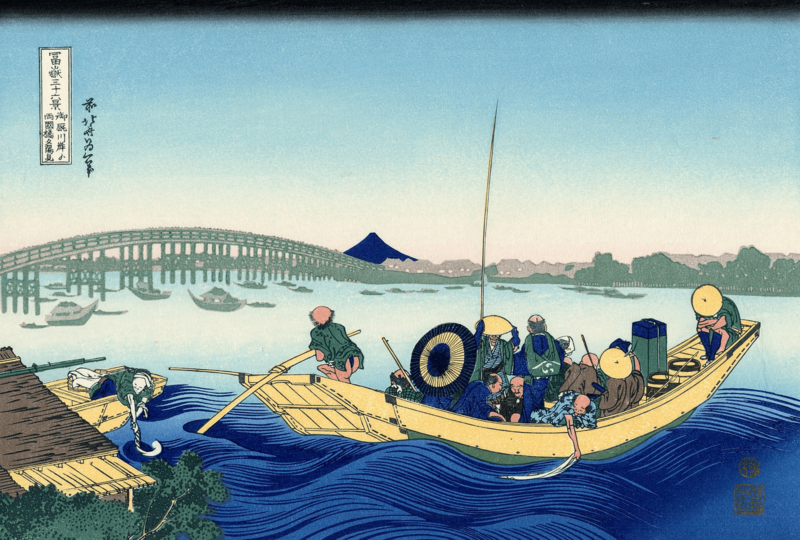 We are lucky that we can still see the same views that Hokusai depicted. 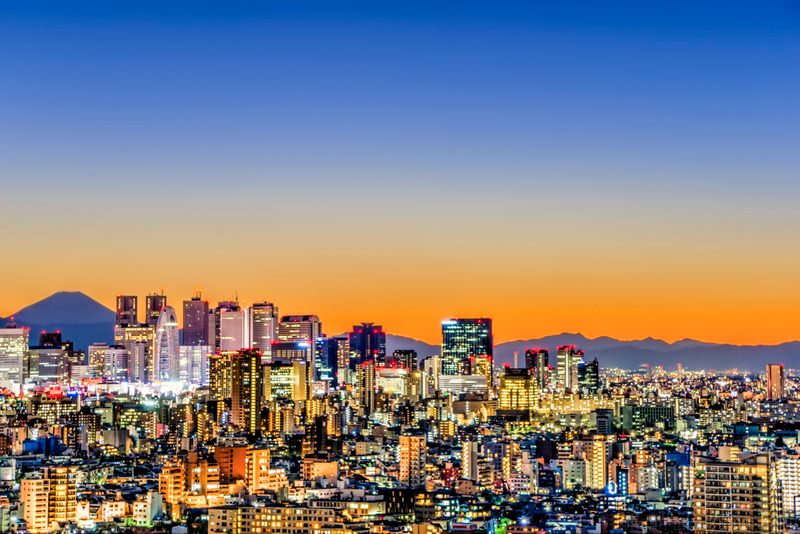 While Fuji has stayed the same, Tokyo has changed beyond compare and now forms its own scenery. Put too many people together, and life can become detached from even the most impressive surroundings. 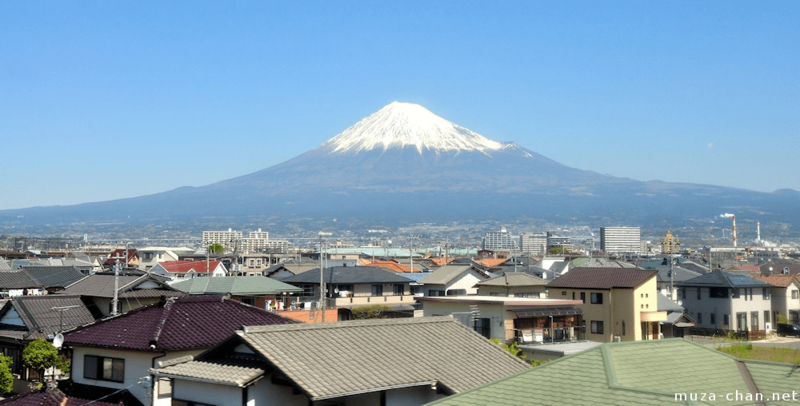 Many of the 36 views of Mount Fuji no longer reveal the looming mountain. Last week we brought back the old favourite of riddles. We will run a set of riddle competitions per season. Here is the new batch and the current standing. Number 5 – Since Robinson Cruse has already been guessed, the only thing I can come up with is Amboy Crater, Mojave Desert, California. Amboy Dukes was the name of Nugent’s band and Derek St. Holmes was a member. Where Defoe fits in, I have no clue. Number 2: Moutohora Island: translated to and aka Whale Island. It had an unsuccessful whaling station, it is a volcano that erupted last in the pleistocene and it is a green wildlife sanctuary and lies in New Zealand where a band named Rhombus comes from. In other news… Piton de la Fournaise on Reunion has begun a fissure eruption. The USGS site describes the area as overdue for a large quake, so I guess the dues have been paid. As far as I know, the epicenter area is uninhabited. Problem is that unless someone of us takes a hike and meander over there it would not be that much to write about. It is a pretty remote volcano, so it is hard to obtain pictures, information and data to toy with. That withstanding, there may be an article sooner or later. Are you saying we are bad at guessing? Nope, keep on trying. Look at the clues that are appended now. This is doing my head in….. Some thoughts that could help others. Carl – can you please indicate hot or cold on these points? Green Jacket – Augusta Golf which leads onto Augusta Australia and Humpback watching. Possibly Flinders Volcano – but only found one reference to this. Or Green as in Moss – Moss Landing in Monteray – was a whaling station and humpbacks can be seen.. Moss Volcano = Mælifell? And as you can see form above there have been other routes!! Can I book into an addiction clinic for tenuous volcanic links syndrome please? Don’t get too strung out. I left a seed for another riddle for Carl to muse about in the back channel. If he takes it on board, I know for a fact more than a few synaptic junctions will short out trying to solve it. An no, if it manifests as a future riddle, I will not be eligible to try to answer it. Are all the answers names of the main volcano or system, or are some of them subfeatures? GL Edit: The gnomes got ya. Yer free now. Only your local Carl or one of his conniving cohorts can answer that. It is the names of the main features. Ted Nugent did hang out with Michael Jackson back in their early sunny days. Jackson also happens to be a Volcano. 4 – All clues point towards something british. Pipes and drums. Exit = brexit. I struggled to find a british volcanic feature matching the initial riddle, but came up with nothing. Then I found that there is a Sunny Art centre in London. I could only find one volcano with London in the name, Isla London, or Fueguino. I think it is Denham Cauldera on Raoul Island (Sunday Island) in NZ there is also a Nugent Island in the same chain and therefore a brother? Raoul Island has a fleetwood bluff. German raider Wolf anchored there. Defoe – not sure of the link but Roul may be an author or the main character in another castaway type novel. According to Google there is also a gardener named Raoul that have worked for Ted. The father of Friday is Sunday. Western Sunny Art (Pipes and drums exiting away). William Tuner famously painted a sunset (western sunny) in the Fighting Temeraire which had vivid colurs from Mt Tambora. Tambora drums are a type of drum that could be used while walking (pipe and drum marchin bands). You bumed out on the Western part. And not even close. btw, Stromboli quite active: every couples minutes a little fontaine. Weird. I found that webcam by accident yesterday and was watching it, too! Mesmerising, watching for the outbursts. Thanks for posting the link! 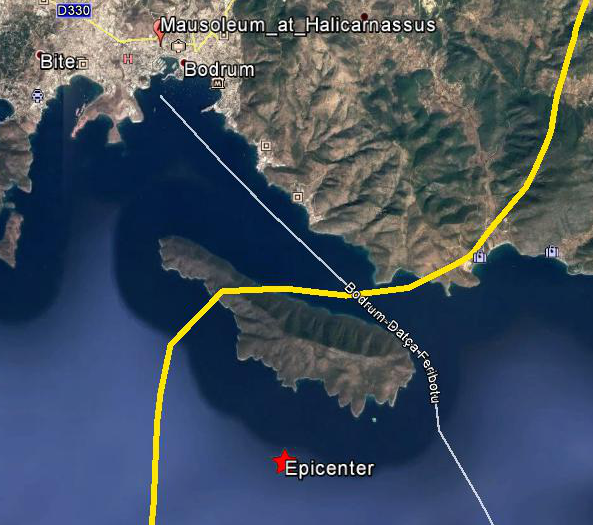 The Mausoleum at Halicarnassus is in this region. The actual location of where the Mausoleum was is in the MMI-VI contour. This fault system could very well be same one that destroyed the Mausoleum years ago. A bit about forecasting volcanoes and Campi Flegrei! There are also the Friday Brainwrecks of volcanic Riddles, happy headache!